Every city has a unique set of sounds. Despite the omnipresence of sound, designers have made rare attempts to create urban spaces that consider the aural sense as the primary target. Parameters that determine the sonic character of a city include cultural influences such as language and religion. Technology and constant change add a set of sonic events to the urban soundscape: The larger and older the city, the greater and more complex the sonic character. Literature shows a division in response to this urban sonic feature. Some researchers embrace it as a token of the greatest achievement and testament to the progress of the species (CHENEVY, 1920). Such research aligned with the opposing side argues that noise is a sign of the stagnation of civilisation. If the “Big City” pandemonium was once thought to be a sign of progress in the early twentieth century, this is no longer the case (SCHAFER, R. Murray, 1993). Sonic events are not distributed uniformly within the city; rather, acoustical character changes owing to differences in social and programmatic organisation between districts, morphology, urban texture and geographic location. This section discusses urban sound character, main principles and spatial relationships to determine the urban soundscape. Soundscape, a concept first formulated by R. Murray Schafer in 1977, is a discipline that mixes aural architecture and sound sources. It is not simply the sum of simultaneously broadcasting tonal signals nor is it merely a by-product of architecture. The term soundscape is the dynamic sonic equivalent of the phrase landscape; it is an integral essence of the environment and exists when the landscape is used. Existing literature attempts to classify sound in various ways. Pierre Schaeffer’s sound classification charts a paradigm that links the sonic event to the object that creates it. In addition to the physical description, each sonic event is classified according to a number of properties, including distance from the receiver, strength in ambience, environment reflectivity and the relationship of the sound to the larger context (SCHAFER, R. Murray, 1993). Schafer classifies soundscape sound into six main categories with various subcategories, including natural, human, cultural, mechanical, indicator sounds and the absence of sound (i.e., silence). This method measures the beginning (attack), middle (body) and end (decay) of the sound against its duration, frequency and dynamics (SCHAFER, R. Murray, 1993). Many sonic disciplines know and use these terms extensively. The attack is the onset of the event accompanied by an electrostatic noise: The more sudden the attack, the more powerful the sound. If the sound is gradual, the electrostatic noise is less present and even tonality occurs. The body is the middle part of a sonic event, and the ear perceives this signal as ‘stationary.’ Some sounds do not have a body (e.g., bells and gongs). The decay is the time lapse from when the end of the sound to the point at which the sound energy decays to one millionth of its original strength (REAS, Casey and Fry, Ben, 2007). In addition to the mentioned physical and perceptual properties, these three sound attributes are significant derivatives of the volume and shape of an urban arena (SCHAFER, R. Murray, 1993). The volume of a large-scale urban arena depends on the sonic property of the target sound and acoustic geography. The geomorphology and macroclimate of the area are natural shaping factors, and urban morphology and materiality are synthesised factors. Geological formations can act as sound barriers or sound conduits. Steep terrain casts large sound shadows while valleys propagate the target sound across large distances. Vegetation is another parameter of auditory demarcation. Grass reduces the reflectivity of the ground and trees absorb airborne sound waves, which casts large sound shadows. A forest on the outskirts of a town creates a thick vegetation edge that stops the propagation of any sound wave. Effectively, the forest acts as a visual and aural barrier, and delineates and aligns the urban arena within the boundaries of a town. Calm bodies of water act as sound reflectors, which increase the size of the urban arena. Conversely, high windshield factors and turbulence along coastlines affect the directionality of sound waves and cause high interference, which can reduce the volume of the urban arena where the coastline is beyond the threshold (BLESSER, Barry and Salter, Linda-Ruth, 2006). A suburban area after a heavy snowstorm produces similar properties to an anechoic space. Snow is a highly absorbent medium, and if it covers the ground thoroughly, a receiver can detect only direct sound waves. Opaque spaces occur in urban settings in different forms. Small alleys in densely built areas create the effect of an acoustically opaque small space. Buildings act as sound barriers and reflect low-frequency sounds. Pedestrian tunnels, spaces under bridges and narrow streets between high-rises produce the same acoustical effect. Alleyways between suburban gardens where fences and hedges could impede visual interaction and allow sonic permeation are examples of acoustically transparent urban spaces (BLESSER, Barry and Salter, Linda-Ruth, 2006). Traditional city networks evolve around a central public space with defined landmarks. Scholars find that these foci usually have socially significant landmarks associated with unique sounds, namely soundmarks. Soundmarks customarily create large urban arenas. Traditionally, anyone who lives beyond the aural space (i.e., cannot hear it) is not considered a citizen of that town (Blesser & Salter, 2006). Corbin (1998) states that an elevated sense of territorial identity is a direct result of soundmarks and regular aural urban architecture. Individuals of different ethnic, socioeconomic, and social backgrounds who live in the same region and who are subjected to the same set of sounds recognise these sounds as ‘home.’ Research finds that aural heritage induces a sense of belonging to a community and national pride when residents hear these soundmarks (Corbin, 1998). Soundmarks can also vary in scale and dynamics. For example, a regular peddler chanting the same tune every day is a dynamic soundmark that may link a number of districts. Trains are another type of dynamic soundmark. A less obvious example of aural heritage is the national morning news tune that emanates from the radio. This type of sonic events creates acoustic arenas that can potentially cover countries (Blesser & Salter, 2006). Soundmarks are also associated with social hierarchy. Societies have established power, time and cultural identity by giving significance to soundmarks. Cultures preceding the industrial revolution adopted human vocals as soundmarks (Blesser & Salter, 2006). During the industrial revolution, a common soundmark in the western world was the bell, in which only the most prestigious and powerful institutions invested (e.g., churches, monasteries, civil governments and entrepreneur factories). Bells held power in Europe for an exceedingly long time. In 1784, the French went so far as to cast thirty-eight bells for the Abby of Saint Armand Les Eaux to create the largest aural arena possible. The number and synchronisation of bell towers connected close parishes within the amplified arena. Considering the importance of bells, their loss, capture, or destruction were common practices by invading armies as signs defeat. In 1813, Napoleon followed a well-established sixteenth-century tradition of melting down bells as a sign of power inauguration (Corbin, 1998). Another common soundmark is the clock. The term ‘clock’ derives from the Middle English word ‘clok,’ which is a Middle Dutch and German word for bell. This word appeared with the earliest mechanical timepieces in Europe during the fourteenth century found in monasteries to inform pious monks of prayer times. These timepieces were designed to sound time, not show it, and they became communal foci. At the time, some argued that the clock was the most notable invention, not the steam engine, and the associated sonic event created a culture of efficiency and punctuality. During the industrial revolution, clocks became a means to ‘synchronise men’ who lived in worker towns near factories. Clocks became linked to factory whistles, which sounded to inform workers of shift change intervals (Levine, 2006). In the East, early Islamic townships also employed soundmarks to establish time (i.e., prayer time), power and territory. The acoustic geography of the region and primitive available technologies prompted human vocal soundmarks. The designated person (Moazen) was chosen for the quality of his voice, and was given social status and bodily protection during war. At designated prayer times, the Moazen took to the highest vantage point to establish the largest aural arena possible. Moazens climbed tall towers or ‘minarets’ built to project the prayer calls across large areas. At the height of the Islamic empire, the status moved from person to architecture. Gradually, the height and number of towers, along with the volume of the arenas centred on them became significant signs of power (Bianca, 2000). Aural and urban design theories share commonalities in spatial concepts. Humans live in the built and natural environments and create an aggregation of human-shaped atomically indivisible units. Programmatic designations and social unit structures determine both types of territories. These associations are the result of the corresponding relationship between the city and soundscape. Urban factors, activities and morphologies determine the aggregate pattern of aural spaces. In turn, sonic character affects social order within urban patches. Aural designs do differ from urban designs in a number of order aspects owing to the ascents of physical restrictions such as gravity and the physical nature of sound. This section draws parallels and contrasts between these two concepts. A Conceptual diagram of the interplay between sonic arenas. [Top - Left] A separate sonic arena. [Top - Right] A group of independent sonic arenas within a larger arena centred on a broadcasting event - All sources are perceived. [Middle - Left] Three sonic arenas centred on identical events, with different relative maximum intensities. The shared sound is amplified in the overlapping zone. [Middle - Right] Two sonic arenas centred on two different sonic events. Neither sound is perceived within the interference zone. [Bottom] A diagram showing the aggregation of sonic arenas in a 3D space. The laws of gravity do not stop the 3D aggregation of aural spaces. The Physical space should be assembled to allow users to perceive the configuration. Aural design units follow the same principles of atomic indivisibility. Acoustic arenas are the equivocal components of rooms. These aural spaces can be aggregated to create larger and more complex soundscape patterns within urban spaces. For example, the acoustic signature of the public square at the Covent Garden in London corresponds to the activities held in its subdomains, including cafés, markets and performances. These separate domains have associated arenas that are in a continual interplay that define the volume, shape and intermediate threshold zones of the arenas that create the sonic patterns of the space [Refer to: Figure 3. 15]. Amplified sonic events (using microphones and speakers) form large aural spaces that interfere with and affect the volume of other activities. Conversely, domains may contain an aggregation of aural subdomains (e.g., normal conversations at individual tables in a café). These types of subspaces are centred on human voices that occur within a certain frequency band. The collective events amplify the effect of the aural space in the café and encroach upon adjacent aural arenas. A perpetual occurrence of sound energy exists as the difference between these two types of spaces, and design concepts reflect this divergence. No equivalent concept exists of the street-building pattern relationship in aural design. Rather, the threshold zones between arenas are those regions where a receiver cannot recognise and consciously interpret a sonic event. In these threshold zones, the receiver detects sound energy as ambient sound. Another contrasting factor is the effect of physical elements, as gravity does not prevent a three-dimensional aggregation of acoustic arenas. In this case, the aural design informs the physical configuration. Supporting spaces (e.g., mezzanine levels) are designed to enable the receiver to experience the three-dimensional pattern. Aural design is successful when the volume allows for its designated spatial use, and the size and number of users that inscribed the volume and form an aural arena. For example, at an outdoor concert, the broadcasted sonic event located at the stage should be heard clearly throughout the entire space. Curbing external interference and spatial design techniques ensure that the aural arena encompasses the entire audience. Soundscapes and sonic patterns flow and inform the urban morphology. If Stephen Marshall’s concept that the social structure of a city follows a characteristic order is taken as true, then aural urban design would follow that same order. Social groups create acoustic territories with specific aural codes that identify cohesive social structures. For example, the Heathrow Express train has designated silent cars where it is considered discourteous to speak on the phone. The same code holds true for American suburbia (LABELLE, Brandon, 2010). Thresholds between communities and aural arenas have blurred demarcations, and the volumes and patterns of urban acoustic subdomains follow urban patch morphology, which is a direct result of inhabiting social group order. Historically, the foci of concentric growing traditional cities were central squares or markets that had specific acoustical signatures or soundmarks. Evidence shows that the location of a soundmark and the volume of the resulting arena within a town are significant factors that determine the morphology of growth. A series of acoustic arenas associated with activities conducted in the extending areas translates and informs the growth of a town. These aural spaces characteristically decrease in SPL and volume as the distance from the central square and the resolution of the street increases. The acoustical signatures of central squares also have a reciprocal relationship with the climate, culture, technology and economics of a city. The density of the aural space network follows that of the urban pattern. A diagram showing the sound pressure attenuation within a sonic arena centred on a soundmark. The order of Sonic Arenas, sound pressure and ambient sound follow the urban hierarchical order it exists in. Urban public spaces are programmatically movement domains. The spatial organisation of these networks is a direct result of information flow. Sonic events are a large subset of this information, and they have a reciprocal relationship with the morphology of these spaces. The characteristic hierarchy of these elements is also reflected in the density of aural arenas that occur within these spaces. As such, SPL and the number of sonic events dissipate outward from the centre and follow the hierarchical fractal structure of the network. The topology of traditional urban networks is a highly connected configuration. The permeability of this network decreases to create narrow spaces as the distance increases from the central square. The resulting spaces are acoustically opaque owing to the circumscribing mass of the buildings. Except for soundmarks, sonic events that occur in central squares seldom permeate through these spaces. The attenuation of sonic events within an impermeable urban fabric creates navigational cues that steer citizens through the public-private gradient. These cues include change in SPL, tonal coloration of low frequencies reflected within tight spaces, and acoustic shadows of distant sounds. Sound pressure levels and ambient sounds become a reciprocal interpretation of the private-public spatial configuration. A diagram showing the Private- Public Exclusive-Inclusive relationships for aural spaces. [Top-Left] Public all inclusive public space. There is always a level of sound pressure [Top-Right] 2 exclusively private domains. Public arenas may affect the private spaces. [Bottom-Left] ‘archipelago’ ordered private sub-domains with direct access to an all encompassing public space. [Bottom -Right] Public-private gradient: Nested public spaces with exclusive restrictions. The aural arenas associated with public spaces follow the same private-public topological order of subdomains. Domains can be mutually exclusive, nested, or in archipelago order. The ephemeral attribute of sound allows for the amalgamation of these topologies. In the absence of physical dividers between domains, the manipulation of physical attributes is key in creating social filters. Ground level changes create social filters, and the qualities of sound define elevation and amount of grade change. For example, an elevated stage creates an exclusive physical domain, and the sonic event that occurs in that space forms an inclusive aural arena, while a fully submerged area (e.g., Vietnam Memorial) creates both an exclusive space and aural arena. Urban design theory informs this research in that a city is an aggregation of indivisible atomic units. The relationship between these units follows a specific order that results in what is identified as city shapeness. Social logic also defines the growth morphology and network configuration of urban components. Similarly, aural design units are atomically indivisible and aural arenas are sound subcomponent equivalents of physical rooms. Aggregating these subcomponents creates a large and complex urban component or soundscape of the urban space. The aural unit is a sonic event or a sound that occurs within a space and creates a dynamic domain centred on it, namely an acoustic arena. Humans perceive this domain aurally and recognise it as a territory with social coherence. The form and volume of acoustic arenas are determined by the physical properties of the sonic event and the materiality and geometry of the space. Auditory spatial awareness is a neurological reaction (conscious and unconscious) to spatial acoustics and is one information channel through which the auditory organ receives stimuli. This cognitive process transforms raw sensation into awareness by triggering an elevated state of mental and physical awareness. The response associated with auditory spatial awareness has three stages: detection, recognition and consciousness. Detection is a raw biological and physiological response. Recognition and consciousness are conditioned by environmental exposure and are learnt associations. The individual perceiving the sound (i.e., sonic event) is the receiver and the resulting vibrations are transformed into neural signals. If detection is established, the receiver is considered within the aural space of the sonic event, also known as the ‘acoustic arena.’ Architects and designer may influence the programmatic aspects of the space directly, but occupants have control over the dynamics of the aural space design. Activities within these spaces create sonic events as the size of the acoustic arena changes (BLESSER, Barry and Salter, Linda-Ruth, 2006). This post discusses the principles of acoustic arenas and the spatial formation of these aural spaces. A superimposed diagram on Pierre Auguste Renoir, Luncheon of the Boating Party (1880-81) [Underlay] The diagram shows different scales of acoustic arenas. Aural architectural space design follows the principles of acoustic arenas. If a sonic event is sufficiently powerful and a group of receivers detects it, an acoustic arena is formed, which is the volume centred on the sonic event. Anyone who cannot hear this sound, even if unable to detect the source visually, is considered beyond the boundary of the arena. Such sound is beyond the receiver’s ‘acoustical horizon,’ a dynamic auditory space centred on the receiver. Arena volumes are as dynamic as the activities that generate sonic events. At any given time, the receiver can exist in multiple arenas, intermittently or simultaneously (BLESSER, Barry and Salter, Linda- Ruth, 2006). A successful acoustical design can exploit this interplay by enhancing the auditory connection between a particular sonic event and the listener. This connection is known as and defined by the sonic properties of the ‘auditory channel’. The properties and the background ambient sounds of a sonic event define the form of the aural space. Acoustic arenas are in constant interplay, and one arena can encroach upon, substitute, or entirely engulf another. Like a visual partition, the auditory demarcation delineates the boundaries of the arena or horizon. This threshold depends on the physical qualities of the sound and the perceptual response of the listener, which blurs the perimeter. The interplay between arenas creates intermediate zones of acoustical interference where detection, recognition and consciousness do not occur. extend beyond its physical boundaries. Alternatively, the activities could create a matrix of aural arenas with interference zones that act as virtual cubicles within the physical boundaries (BLESSER, Barry and Salter, Linda-Ruth, 2006). This set of basic acoustic arena principles is the foundation of the algorithm and paradigm used in this study. The volume and shape of an arena are highly dependent on the sensory modality and physical attributes of the sound and surrounding space. In the abstract, an arena exists in free space as a spherical form. The reflectivity and form of the adjacent surfaces have a direct effect on the shape and volume of the aural space and its location (BLESSER, Barry and Salter, Linda-Ruth, 2006). For example, Bill Fontana’s technique of targeting sound energy toward a specific wall manipulates the shape of his designed aural domains (DUFF, Simon, 2011). The scale of the three-dimensional aural space is related directly to loudness (i.e., volume in m3). Designers can use sound intensity and the surrounding absorption coefficient of the material to manipulate volume. Aural sensory design is a hybrid of two juxtaposing concepts, the physics of sound and the human perceptual response. Volume depends on the perceptual response to the frequency of the sonic arena; low-frequency sonic events create small arenas (TURNER, John and Pretlove, A.J., 1991). A physical space with highly reflective surfaces creates significantly large acoustic spaces and vice versa. An aural designer can increase the volume of an arena without increasing reverberation time by creating strong reflections that reach the listener shortly after the direct sound, as they are detected as one strong aural channel (BLESSER, Barry and Salter, Linda-Ruth, 2006). In the abstract, the volume of an arena centred on one sonic event with no interference is considered to propagate uniformly in all directions to create a spherical space. Energy loss defines the distance from the sonic event to the edge of the aural space (i.e., radius of a spherical arena). Sound energy is absorbed as waves that travel through the air and reflect off surfaces. Sound is measured by different units; the perception of sound is measured along a logarithmic decibel scale (dB) and is often referred to as sound pressure levels (SPL). The smallest change the human ear can detect is 1-3 dB (TURNER, John and Pretlove, A.J., 1991). The size of an acoustic arena and the enveloping shape of the auditory demarcation are directly related to the decibel scale. This phenomenon exists at many spatial scales, including intimate, personal, conversational, public and urban. The volume of an intimate arena is approximately half a meter in diameter. The most obvious example is an arena of two people whispering, which creates a domain with an SPL of 20 dB (BLESSER, Barry and Salter, Linda-Ruth, 2006). Less researched examples are the intimate spheres that form within highly noisy environments, such as speaking loudly at a nightclub or on a cliff during a strong gust of wind. The difference is that the threshold in the first example is entirely dependent on energy loss and the later arena shrinks because of high interference (TURNER, John and Pretlove, A.J., 1991). A normal conversation creates a ‘personal’ scale arena, approximately one meter in diameter, and the conversational arena may extend up to four meters. Similar to the intimate arena, these diameters contract in high-interference environments (BLESSER, Barry and Salter, Linda-Ruth, 2006). Humans perceive sound binaurally through two receiving organs (i.e., ears) separated by the radius of the head. The ears receive two independent channels and convert spatial attributes into one spatial ‘image.’ The acoustic behaviour of adjacent objects and geometry result in aural navigational cues, such as time difference, amplitude and spectrum. Close surfaces in small spaces amplify low-frequency (heartbeats) and strengthen the resonance of high-frequency sounds. Aural cues also support spatial navigation. For example, one experiment prompts blindfolded subjects to walk down a corridor. When subjects start at the centre, their ears detect similar tonal coloration reflections on both sides. If subjects deviate to one side, they detect a change in low-frequency tonal coloration in the ear corresponding to that side. Findings reveal that upon perceiving this change, subjects, consciously or subconsciously, correct their courses back toward the centre (BLESSER, Barry and Salter, Linda-Ruth, 2006). Normally, low-level sonic reflections occur in any space. The brain creates spatial mental maps that allow the individual to determine the location and direction of a sonic event. The decoding process distinguishes sonic reflections from direct sound waves. If the receiver is located between a wall and a sonic event, the ear closer to the surface detects tonal coloration and the other ear detects direct waves. A sonic shadow occurs if the sonic event and the receiver are on opposite sides of the wall. The type of sonic shadow depends on the physical aspects of the sound wave and the wall. For example, a low-frequency sound casts blurred and diffused shadows, while a high-frequency sound casts sharp shadows. Open door frames also create discernible acoustic shadows cues. In this instance, the listener registers two cues, the absence of tonal coloration at the gap in the surface and the sonic shadow that results from the sound beyond the opening (BLESSER, Barry and Salter, Linda-Ruth, 2006). Cue fidelity also changes in unnatural environments. Humans are not as adept in recognising directionality cues within high resonant, small or anechoic spaces. Anechoic spaces, considered ‘aurally dark,’ are typologies where sound waves do not reflect and are especially uncommon. Spaces can also be perceived as acoustically ‘opaque’ or ‘transparent’. An opaque space refers to one where the sounds inside are reflected back and no external sonic event permeates through the envelope. An acoustically transparent space allows the internal sonic events to propagate to the external environment while external sounds infiltrate the interior space (BLESSER, Barry and Salter, Linda-Ruth, 2006). A diagram comparing transparent and opaque acoustical spaces. [Left] Acoustically opaque. [Middle] Visually transparent but acoustically opaque. [Right] Acoustically transparent and visually opaque. Acoustical mirrors or “listening ears” were used during World War I until they were replaced by radar technology. In fact, in the 1930’s there were attempts to establish a sonic connection between England and France across the channel. The previous posts provided the reasoning for the study hypothesis and addressed the research question, “Is it possible to develop a public space design model derived from acoustical phenomena and aural spatial qualities?” The second research question is, “If so, how is the urban morphology of the public space reflected in aural spatial patterns, and what principles determine these formations?” To answer this question, the next research post briefly discusses the intersecting research fields; specifically, urban design and aural spatial awareness. Urban design theory is a large and intricate field. This post discusses the aspects that pertain to the research topic, including urban order, growth morphology and network configuration. In the abstract, aural spatial awareness research considers how spaces are perceived aurally and determines what design manipulation techniques are needed during the design process. In the next post, an urban sonic discourse follows and draws parallels between urban and aural design elements, such as soundmarks and soundscapes. These urban sonic features are explained in terms of their significance in urban settings and symbiotic relationships with urban order, growth morphology and network patterns. Cities are unique in that each has a recognisable ‘city shapeness’ and a general pattern that result from a common unit order that defines it as a city (MARSHALL, Stephen, 2008). The city emerges as the primary environment of the human species. One reoccurring research topic is the sonic character of a city, specifically, curbing noise pollution levels and restricting undesirable sound-level penetration in interior spaces. Before discussing the uniqueness of the sonic pressure of a city and factors that define urban aural design, this post addresses the nature of cities to develop an understanding of structure and functional design. Modern cities have more complex soundscapes that are often planned features. Marshall (2008) argues that traditional urbanism functions better at the human scale and provides better public spaces for citizens to interact. This research examines historic traditional cities with pedestrian-friendly streets and public squares (plazas, piazzas, or courtyards) to examine receivers’ (i.e., humans) responses to the morphology and sonic events of the space. Ancient city plans, such as those in nineteenth-century Europe and adapted ancient Roman cities are initially planned but growth patterns do not show any signs of pre-design. As a whole, these cities seem to have city shapeness or an identifiable urban morphology. This morphology is a result of the association between individual units. The complex aggregation of these units (streets and building blocks) creates urban public space patterns and networks (MARSHALL, Stephen, 2008). Conversely, traditional Islamic cities do not have formally institutionalised planning, which results in amorphic patterns of growth that emerge around built archetypes. Friday mosques, embedded in a framework of central markets fulfil institutional functions. No specific morphological growth pattern exists in Islamic cities; rather, they develop according to site constraints, community size, economic resources and building materials (BIANCA, Stefano, 2000). Damascus, an ancient North African city, retains the inner morphological affinities of the earliest Arab cities. When appropriated, Damascus was planned per Roman traditional town-planning regulations with a strict grid layout and main axial roads. With the Islamic adaptation, the grid was no longer the governing factor of the morphology of public spaces or residential districts. The main roads started to secede into smaller pedestrian parallel paths around small market structures. Privacy became the deciding factor in creating a broken flow of successive hierarchal streets that ended in courtyards. This shift led to inward-oriented autonomous units that formed around courtyards. Research suggests that traditional communities centre on religious beliefs (Muslim, Christian, or any other) materialise their environments to reflect the individual perceptions of universal truth (BIANCA, Stefano, 2000). This definition is relevant to the current study in which sonic events originating from the foci of communities infiltrate private residential districts and define their sonic characters. Designers across the spectrum of spatial scale tackle design problems by addressing how fundamental units work together; architectural elemental units include spatial components such as rooms and circulating corridors. Urban designers use similar components at a larger scale (building blocks and public urban spaces). Design units are the indivisible components that would lose functional integrity if fragmented. In other words, units are unable to exist independently; they only function as an aggregation of other urban units. For example, a room cannot function in isolation; rather, the composite of rooms acts as a subcomponent arranged in a determined order to form a building, and the building forms an urban unit. If the dimensions of one subcomponent (e.g., room) are multiplied the unit may act as self-sufficient (small building or cabin) (MARSHALL, Stephen, 2008). An adapted diagram of Sub-component Aggregation. (a) A sub-component can not be a stand-alone element (b) If a sub-component’s dimensions are increased it can act as a ’whole’. (c) A two-dimensional array of subcomponents assembling a complete component, with the ground as a common datum (d) A three-dimensional array of sub-component assembling a complete component (building) (e) A two-dimensional array, where sub-components are aggregated with intermittent ‘void’- (public space), moving into urban scale. (f) A three-dimensional array of sub-component, where subcomponents are aggregated with intermittent ‘void’ – against gravity Original Image Reference: (Marshall, Cities, Design & Evolution, 2008). Buildings are designed around interior artificial environments designed at a human scale, which is determined by the size of the average human in an upright position. The form of interior spaces is not a coffin-like box influenced by this defining measurable scale and number of humans. Rather, form is derived from the psychological and intellectual characters of inhabiting users and social activities. When the same subcomponent is repeated in a straightforward two-dimensional or complex three-dimensional array, a unit structure, such as a city block or building, evolves at a larger scale. Even though the number of atomic units increases, the overall cell maintains a state of ‘wholeness,’ as with a building. Similarly, buildings assembled in two-dimensional arrangements become subcomponents of a more complex ‘whole’ or urban fabric (MARSHALL, Stephen, 2008). When the subcomponents become part of the urban fabric, the system is transferred from a building scale to an urban scale. The two-dimensional aggregation of the building blocks generates an indivisible unit (void or streets) without which the nature of the new unit could not exist. If buildings are constructed adjacently, without streets and public spaces, the result is a larger building block, not an urban fabric. The size and form of a building or urban fabric is a derivation of the size, number and aggregation system of the subcomponents (MARSHALL, Stephen, 2008). Theoretically, a three-dimensional version of this solid-void system is possible; however, gravitational forces render it impractical. This discussion does not consider this impractically, but it is referenced in the following section with a discussion on aural design. Aural spatial units follow the same logic in which the activity held and the number of users in the domain determines the unseen boundaries. Prior to modern communication and transportation growth factors, the sonic character of a city was coherent. Consistent indications infer the effect of sound on the morphological growth of old townships and the formation of city edges. The strongest defining sound customarily originated from the centre of the town (BLESSER, Barry and Salter, Linda-Ruth, 2006). Therefore, it is pivotal to understand the basic concept and defining factors of urban growth. Urban growth is ‘human-shaped’ and based on a social logic and theoretical order of building blocks and streets. A society is a group of humans who vary in gender, generation, and economic statuses and co-exist by abiding by a contract. Such agreement states that all parties (everyone in society) agree to limit some of their freedoms (MARSHALL, Stephen, 2008). Despite the differences in regional climates, cultures, technologies and economies, urban forms are diversely evident over space and time. Urban order goes beyond the abstract unit typologies of buildings and public voids; it is also defined by users’ purposes (i.e., programmatic use). Social groups (communities/neighbourhoods) and social units (family/workplace) are units that contribute to urban order, form and growth. Similar to the physical spatial units of cities, these units are the building blocks of society that have hierarchical structure. Buildings form around the social organisation and define the relation between social and spatial structures. For example, the form of a Greek amphitheatre reflects the relationship between the performers and the audience. Because of this relationship, buildings grow and become more complex as social units increase in size and complexity. Various practical and social factors can prevent indefinite growth (MARSHALL, Stephen, 2008). Cities are like living organisms; larger animals have different forms compared to smaller ones (STEADMAN, Philip, 2008). Unlike a building, city growth morphology is not only a monolithic aggregation of buildings; it grows as a textured fabric. As the system grows beyond sustainability, the resulting strain forces the settlement to become a larger social container or a city with distinct urban patches. In turn, urban patches (districts) become aggregating subunits of a city that form around social groups (MARSHALL, Stephen, 2008). Concentric city growth is the most frequent morphology in which inner centralised higher functions are surrounded by lower and newer ones. This typically unplanned tradition is found in the irregular aggregation of street pattern shapes, which occur at different lengths and angles. Traditional cities implement a planned systematic order at the urban fabric scale. The corresponding fundamental units demonstrate a correlated pattern to each other, as they do to the whole city. The social structure of the city follows a characteristic, rather than systematic, order. Areas inhabited by similar social groups (e.g., ethnic backgrounds or economic status) are directly identified as communities or neighbourhoods. Thresholds between these neighbourhoods become blurred and separate urban patches with different morphological characteristics, which are the direct result of the social groups inhabiting these patches (MARSHALL, Stephen, 2008). Studying street networks and patterns provides an understanding of urban growth and morphology (MARSHALL, Stephen, 2005). Structurally, a city is an organisational network similar to the internet. The structure differs from other organisational networks in that it has a common planar datum that grounds it into a two-dimensional plane. Street and urban space networks are arguably a contributing factor to better city design. Space networks are system units or single lines that create the signature skeletal structure of the city. Thus, the network structure depends on the contiguity of these linear elements (MARSHALL, Stephen, 2008). Historically, central places and main routes illustrate a reverse relation to modern planned cities. Markets, plazas and squares are urban circulation cores, and the intensity of the circulation dissipates outward from the foci. Movement is the main programmatic function of spaces created between city blocks. Spatial organization and the morphology of these ‘movement spaces’ is a direct result of the information flow, geometry and connectivity topology (MARSHALL, Stephen, 2005). Characteristically, urban networks are arranged in a hierarchical fractal structure, and principal arterial streets are connected strategically to form a single network. Lower-order streets feed off this system but are not necessarily totally connected (MARSHALL, Stephen, 2005). The characteristic connectivity of streets highlights these elements as the components that create the urban network structure. Although this structure may appear irregular, it is a systematic order known as urban syntax (MARSHALL, Stephen, 2008). Urban design research designates various classifications and descriptors for urban network patterns. Some descriptors refer to street configurations or intersection topologies, while others refer to the alignment of streets and urban spaces. Marshall (2005) argues that recognised sets depend on the target of study . He also points out that urban morphology classification requires emphasising the geometry of formed blocks. The case studies considered in this research warrant discussing Marshall’s A-type (Altstadt) network topology, which is typical of old walled cities with angular routes oriented in various directions. Often, this pattern topology is seen as the core of the city, and rudimentarily grows radially outward. As a result, the configuration of the urban network may have high connectivity, but it is characteristically impermeable (MARSHALL, Stephen, 2005). Only when both streets and buildings exist can a city substantiate. Streets and public spaces are not just the void between buildings; they are urban units and are a part of the urban social fabric. Public spaces are designed as void volume that is circumscribed by the vertical elements of a city. In general, cities have significant vertical dimensions; however, the ‘urban signature’ of a city is distinguished along a datum surface. Thus, city shapeness is better represented as a two-dimensional organisational plan. A typical city plan has a set of isolated similar areas (land parcels) surrounded by linear interdependent and interconnected elements (streets systems). This order is known as archipelagos, a system illustrated in the continents surrounded by oceans. The contiguity of street systems regulates urban order, and private plots connect directly to this contiguous network. Buildings located on these private plots house social groups comprised of various types of social units. The route network is a conjugating tissue of public spaces between these social groups (MARSHALL, Stephen, 2008). Historically, public spaces have social character. For example, centralised squares, market places and main streets have a ‘people’s place’ role that is rich with diverse and complex programmatic responses to the social fabric. One can consider the visual morphology of a space as an ‘outdoor room’ with a direct relationship to the encircling buildings. Social asymmetries exist within social groups (the government and the governed), and they determine the hierarchical path of information flow (e.g., where and to whom certain information circulates). With advances in communication and transportation technologies, this social hierarchy may exist in a non-physical state, and the nature of the hierarchy and information flow trajectory define urban morphology (MARSHALL, Stephen, 2008). Subtle social complexities and proximities result in the interpretation of private and public spaces. A public domain implies that it is an uncontrolled all-inclusive space. ‘Strangers’ do not need to behave according to certain rules other than popular social conventions. Public spaces are inclusive distinct foci where different social groups interact and communicate. The private-public order is a key social construct that manifests across the urban fabric and the programmatic use of the domain determines the topological order that forms the public space. Thus, a domain can be designed to encompass more than one or to be mutually exclusive. archipelago order. Nested topology is a more complex hierarchical configuration with a public-private gradient of residual inclusive domains that is determined by the programmatic use of the public space. Specifically, the design manipulates the physical attributes of the space to establish a hierarchy by employing subdividing barriers that do not need to be visually barring. For example, roping off a café sitting area with knee-high poles is sufficient to create an exclusive domain for patrons. A change in ground level is also a spatial filter. For example, in an assembly area, a stage or platform creates a social filter between the performers and the audience (MARSHALL, Stephen, 2008). Sound is regularly a subsidiary design parameter to visual manipulations, and even more so for urban design. The present concept may be owed to the ephemeral nature of sound or the aggregate algorithms that operate numerous datasets. While people do not experience space through any one sense alone, the prevailing design standard procedures address, almost exclusively, one sense—sight. Architects and urban designers are aware that humans use multiple senses to comprehend their built (and natural) environments. Notwithstanding, the integration of manipulation design techniques of additional senses customarily occurs at the secondary stage because the eyes are the prime signal receptors in structuring mental maps. This argument maintains that the aural sense is complementary and, therefore, is approached as such. Extensive research exists in other disciplines that addresses sound upon which architectural design can build. Artists, scientists and engineers have investigated the effects of sound on human physiology, building structures, biological organisms, and even electronic devices. Sound has been an imperative feature in singular cases of spatial design that attend to either acoustic engineering or designs that generate emotional responses. Reports determine that users encounter a cerebral awareness within spaces that successfully integrate aural manipulation techniques. To examine new design methods, this study contemplates sound as a primary determining design parameter. Through cross-disciplinary research, the paradigm construction applied here considers sound properties and human responses. Science illustrates that a visual impairment is less detrimental than is a hearing impairment. The difficulty lies in the firm link between the aural sense and language development; without language and the ability to interpret speech intonations, one cannot form logical thought. Neurologists indicate that more than one cerebral region governs sound processing and manages speech coordination. Evidence indicates that the human brain evolved to respond immediately and instinctively to sound through the startle reflex as part of the survival instinct. In fact, the brain evolved to separate the decoding tasks of sound properties to different regions and to provide associations that facilitate spatial mapping, such as event comprehension, danger detection and survival response. Contrary to the neurobiological configuration of the other senses, the signal-receiving organ (i.e., the ear) and the initial cerebral decoding area (auditory primary cortex) are frequency selective (i.e., tonotopically mapped). The inner ear and cortex configurations have an approximate oneto- one relationship with audible frequency rates. The corresponding biological and neurological configurations infer that the fidelity of aural stimuli is much higher than that of any other sense, which enables more accurate spatial mental mapping. Hence, the premise that vision is the primary human sense and must be the principal design parameter is not accurate. Through this reasoning, this research looks at the biological and neurological means involved in perceiving sound, and the cerebral associations that enable individuals to chart their surroundings and to become aurally aware of the spaces they occupy. This study employs the acquired biological and neurological facts to trace parallels between theories found in musicology and published aural experiences in two groups of architectural precedents. The first group examined includes projects designed to integrate two (or more) senses to generate an emotional response appropriate to the intended narrative, ‘Trauma Architecture’. The second group of archetypes examines a range of acoustic and aural design practices. Several ancient cultures were aware of the qualities of sound and applied them as ways to communicate, broadcast information, and impose a narrative of ‘grandeur’ in their temples. This study reviews two historical examples and discusses modern research used to analyse these structures. The second subgroup considers acoustically engineered performance halls. These precedents are not built for a specific narrative; rather, they are designed to deliver a performance narration (music, choreography, or drama) as composed by the artists. Performance hall designers employ the same fundamental parameters (geometry and material) used in other precedents toward a technical effect while leaving room for the performance to insert its narrative. Another group includes interdisciplinary archetype systems invented by aural designers, which are the closest models to the approach of this thesis. Xenakis and Fontana, likewise, utilise the same fundamental parameters, but under the expanded definition of aural architecture. The process alternates between selecting existing spaces for their sonic features and building aural spaces. Both strategies infer an elemental social criterion. Xenakis designed buildings to create aural experiences while Fontana extracts the aural events in an otherwise static structure. Their works, along with the other presented aural and acoustic models suggest that the design directly influences the programmatic aspects of and the relationship among occupants who have authority over the perception and dynamics of an aural space. As with early cultures, the thresholds between sound and space seem to blur as further investigations across diverse domains emerge. This chapter establishes the foundation required to answer the initial question of this thesis: “Is it possible to develop an urban public space design model derived by acoustical phenomena and aural spatial qualities?” The paradigm presented here demonstrates that humans typically apprehend these qualities. Accordingly, this discourse prepares for the following discussion on the parallels between the fundamentals of urban design and aural spatial awareness. With that, this up-coming posts proceed to investigate that inquiry by emphasising the two principal perceptual aural components that contribute to the spatial mapping of a particular type of urban setting via aural cues. The first is unique urban sounds and the second is fundamental acoustic characteristics (materials and geometry) in play. The brain is divided into four hemispheres, the frontal, parietal, occipital, and temporal lobes. The frontal lobe manages planning, organises perception, and governs spatial apprehension. The parietal lobe is involved in sensation and perception of various signals from the skin, ears and eyes. The occipital lobe specialises in ocular processing and spatial apprehension in conjunction with the frontal lobe. The oldest part of the brain is the cerebellum, which governs primal instincts, and is located below the temporal lobe, close to the brain stem. The cerebellum controls the motor and coordination functions, as well as emotional responses (BALL, Phillip, 2011). The primary auditory cortex resides in the temporal lobe where sound stimuli and speech semantics are first received from the ear. The temporal lobe also houses the hippocampus (long-term memory) and the amygdala (the emotional centre). The Anatomy of the Brain - Major sound and music computational centres of the brain. [Right] Side View: front brain is to the left [Left] Cross Section: Same orientation The Primary Auditory cortex is the first area to receive and decode pitch. It is Tonotopically Mapped. The Cerebellum is the oldest part of the brain. It is responsible for the primal response to sound (Startle and Movement). Diagram adapted from original illustrations by Mark Tramo 2001 (LEVITIN, Daniel J, 2007) and (BALL, Phillip, 2011). Sound is apprehended as air vibrations. When an object is manipulated (i.e., struck or driven by an oscillating electromagnetic field), it vibrates at its fundamental frequency. A shift in state occurs, which induces oscillations (successive compressions and depressions) in the immediate encircling air. Particle vibrations propagate from the object to the outer ear (BALL, Phillip, 2011). The funnel-like form of the outer ear deflects the waves through the ear canal toward the eardrum. Simplified longitudinal anatomical cross section of the human ear. The ear transforms air vibrations to electro chemical brain signals through a series of mechanical and hydrodynamic systems The diagram is an adaptation of Swiss National Sound Archives’ original (FONOTECA NAZIONALE SVIZZERA). The small Eustachian tube connects the middle ear and mouth and equalises the atmospheric pressure on both sides of the eardrum. This equilibrium creates a state in which the membrane fluctuates only in response to minute changes in pressure caused by sound waves. The eardrum is connected to the oval window by a system of small bones in the middle ear (the malleus, incus and stapes, collectively known as the ossicles). The oval window separates the air-filled middle ear from the liquid-filled inner ear. The ossicles act as a mechanical lever system that amplifies eardrum deflections and passes the motion onto the oval window. The deflection of the oval window transforms the mechanical vibrations to the hydromechanical system of the inner ear (TURNER, John and Pretlove, A.J., 1991). Aside from governing balance, the inner ear conducts an electrochemical process that translates acoustic vibrations into nerve signals and transmits them to the primary auditory cortex. The cochlea, a small spiral liquid-filled chamber lined with the basilar membrane and overlaid with sound-sensitive hair cells, manages this process. In response to vibrations, the cochlea hair cells oscillate within the enclosed fluid. This oscillating motion opens pores in the cell walls to release electrically charged metal atoms. The change in electric state produces neural signals that surge through the cochlear nerve fibres to the brain. These cells are tonotopically mapped (spatial organisation based on frequency); that is, different hair cells respond to different frequencies. This corresponding configuration linearly progresses along the basilar membrane; low frequencies resonate at one end and high frequencies are apprehended toward the other end (BALL, Phillip, 2011). Longitudinal section of an unrolled cochlea and an accompanying graph showing the response maxima. The sensitivity of different parts of the Basilar Membrane to a number of pure tonal frequencies. The Basilar Membrane is tonotopically mapped . Diagram adapted from the original by Bruel & Kjaer Ltd (TURNER, John and Pretlove, A.J., 1991). Auditory cognition occurs when an audio signal changes its mechanical nature, progresses through mechanical and hydrodynamic states, and ends as an electrochemical signal at the auditory cortex. The diaphragms, levers, and sensitivity hairs enable the ear to cope with a frequency range of 20Hz to 16-20Hz (TURNER, John and Pretlove, A.J., 1991). Perception of sound depends on the decoding processes of the brain. To interpret the pitch of a sound instantly, each pitch-selective neuron in the primary auditory cortex directly connected to and dedicated exclusively for a segment of the basilar membrane to interpret the pitch of a sound instantly. This unique perceptual stimulus one-to-one neural mapping has no equivalent in any other sense. Part of preliminary pitch and speech processing occurs in the brain stem as raw data. Electrochemical signals travel from the cochlea to the primary auditory cortex via the brain stem and the primitive, subcortical brain is triggered immediately with stimulus detection. The cerebellum decodes the rhythm, and the thalamus assesses the signal, ready to trigger a subconscious survival reflex. The thalamus then signals the amygdala to generate an emotional response (BALL, Phillip, 2011). This low-level decoding occurs before any complex cognitive processes as a primary startle response of alertness. Once the primal evaluation is complete, all high-level processes commence and continuously register neural projections from sensory receptors and low-level processing regions. This process is termed bottom-up processing in which properties of the collected signal are separable and can change independently. Different neural circuits manage the information carried by the stimulus. Through a top-down process, high-level centres update the input data steadily, read only the overall cognitive information, and influence low-level modules. This two-way exchange integrates these signal attributes into a perceptual whole (LEVITIN, Daniel J, 2007). The prefrontal cortex manages high-level processes such as awareness and expectations, which are the result of associations that the hippocampus creates by correlating the received signal to retained memories. The language centre (Broca) of the prefrontal cortex evaluates syntactic aspects of sound (e.g., speech or music) by transcribing pitch into language. The principal attribute in aural cognition is pitch analysis. Pitch concatenations encode an entire spectrum of sound dimensions, and the brain commissions separate modules to execute each dimension. Pitch dissection leads to melody processing, harmonic structuring, and distinct voice and timber identification. Pitch and rhythm are also the general audible characteristics required to decipher speech and ambient sound. Rhythm and event duration provide clues for pitch qualities and trigger motor responses (BALL, Phillip, 2011). This motor response explains the motivation to dance when listening to intricate rhythmic songs, and the emergent behaviour of falling into step on a crowded street (WITEK, Maria A. G. et al., 2014). The human visual and auditory senses evolved together. Unlike ears, eyes have lids, and, even in vacuum, a person can apprehend his or her heartbeat, movement of internal organs and blood flow. An example of this perception is unborn children who are aware of their surroundings through sound perception (GAUNDERLACH, Jonathan, 2007). The auditory sense evolved primarily to increase awareness of one’s surroundings, to detect danger, and to communicate. This research recognises that spatial awareness occurs when the auditory organ receives and neural synapses decipher stimuli. Thus, the auditory sense is the primary channel of comprehension and communication. This premise is based on research and testaments of aurally impaired individuals who report that being deaf is potentially a more serious challenge than is being visually impaired. Children who are born deaf or who lose their hearing ability before language acquisition are at a greater disadvantage than are post-lingually aural disabled individuals because infants acquire a database of connections that link optical with aural memories. These associations promote the development of survival responses to signals, language acquisition and eventually logical thought. If hearing is absent at childbirth, the hearing community and surrounding environment is incompatible with the child’s communicative abilities* (SACKS, Oliver, 1989, 1990). For the average hearing individual, sound defines the surrounding environment. The sonic character of one’s habitat is a compilation of sounds from a variety of sources. Humans adapt to the acoustics of their natural ecosystems (soundscapes) and the significant differences between aural and olfactory horizons. For example, where dense vegetation exists, the olfactory horizons are significantly closer than are the aural horizons. The Mayan civilization shows evidence of aural manipulations in the architecture of their temples, communities and traditions (ANITEI, Stefan, 2007). Modern humans have readjusted to urban soundscapes, public gathering spaces and enclosed dwellings. They have accumulated a visual-aural associated memory for generations. Among the oldest sounds that have mediated the human species’ acoustic perception are geographic sonic textures such as windshield factor, adjacent bodies of water, vegetation, topography and the sounds of other species. Culture, language and communal interactions outline the overall regional pitch (BLESSER, Barry and Salter, Linda-Ruth, 2006). Post-industrial revolution technology creates noise, a polluting agent (1893). Recent research puts it more accurately: Technology creates a background of ambient sounds (SCHAFER, R. Murray, 1993). Some artists dub this phenomenon as the natural rhythm of the city (FONTANA, Bill, 2011). There is an argument for experimental design based on individuals’ abilities to comprehend their surroundings through auditory spatial awareness. This process is a neurological conscious and unconscious reaction to spatial acoustics. When the receiver (i.e., listener) is subjected to a sonic event, physical sound waves are transformed into neural signals, sound is detected, and a cognitive process transforms the raw sensation into awareness. A visceral response is also triggered in which an elevated state of mental and physical awareness occurs (BLESSER, Barry and Salter, Linda-Ruth, 2006). *In Seeing Voices, Oliver Sacks explains that pre-lingually impaired individuals can still learn language and rational thought if they adopt a language compatible to their abilities, namely sign language. He explains that if a community (e.g., Martha’s Vineyard, MA) adopts sign language, aurally impaired individuals will live normally within that community (SACKS, Oliver, 1989, 1990). Trauma related art is generally more effective when it is transactive, where the user’s senses are trigger in a seemingly quasi order, which forms a medium where a single narrative is communicated. Psychologists argue that trauma cannot be articulated within a conventional space, because it is experienced as a “hole in the psyche”. We, as humans, perceive death as the absence of a whole person, rather than the vague idea of loss of life. Thus, memorial design usually utilizes non-space, or absent space by speaking to the senses and conveying a “sensed space”. In this piece I will examine three different sense manipulatory architectural occurrences; Yad Vesham – the Holocaust Martyrs’ and Heroes’ Remembrance Authority in Jerusalem, the Holocaust Memorial in Berlin, and the Vietnam Memorial in Washington DC. These three examples are chosen for the abundance of information on how the designer successfully attempts to manipulate more than one sense to communicate a specific, yet subtle, narrative. Initially, I will state some background facts of each architectural cases; and then, based on found research, illustrate the similarity or differences used to manipulate each sense referring to the intended narrative. Finally, I will give my take on the auditory phenomena that is experienced enhancing the overall apprehended phenomena. Yad Vesham is a landscape in remembrance of the heroes and lost lives of the Holocaust; and evolved over a series of generations. The different buildings plotted in the landscape are designed to follow the communities ideology adopted at the time. Initially, the buildings’ designed, in the 1970′s and until the mid 1980′s, signified and glorified fighters and heroes. Starting from the late 1980′s, the communities ideology shifted to denote respect for the losses of life and perception of survivors’ trauma. The Holocaust Memorial in Berlin was designed to follow the latest ideology, as the competition was held in the late 1990′s and was finally built in 2004. Peter Eisenman’s design met allot of opposition due to the location of the site, in Germany, which has worked hard to overcome that part of its history. Thus, the design, effectively, uses subliminal narratives by speaking to the visitors senses, in lieu of physical evidence. On the other hand, the Vietnam Memorial in Washington DC is a part of the Washington Mall in the United States capital, which is a setting for many symbolically and significant buildings and monuments; such as the post civil war reconciliation. This indicates that the United States has not only recognized the loss of life, but also accepted the trauma of the war as an integral part of the Nation’s history. The Vietnam Memorial is considered to be an “absent space”; meaning it is only a reflective wall, where an entire space could be seen and experienced through the field of depth viewed within the reflection. Conventionally, architectural works primarily speak to the visual sense. Every design and element is designed to manipulate our perception of light, sense of equilibrium, and human scale reference. All three architectural examples use similar design techniques, although very differ in materiality, but equally effective in manipulating the visual perception of the visitor. Single file movement, forced by a tight space, concept is used in two different ways in Yad Vesham, as well as, the Holocaust Memorial in Berlin. The inscribed diameter of the prism like main museum circulation path narrows at the darkest point of the path. Also, In the children’s museum, the entrance is through a small door and then bunker like tunnels, leading to a dark room. Due to the circulation path this subconsciously communicates solitude. In addition, the inability to clearly see ahead, where view is blocked by the visitors ahead, gives a sense of apprehension of the unknown destination. On the other hand, in Eisenman’s design the free circulation offers a similar feeling of confinement. However, due to the drop in ground levels the visitor has a clear view in the distance, but no overall view; resulting in a risk of collision at every corner. In addition, this memorial differs where solitude is not what unsettles the viewer, but due to the free flow circulation and visitors always having to jostle their way past others; this results in an experience which one comes closer to oneself trying to avoid strangers. Entering the Vietnam Memorial is via descending into a space set into the ground. The overall view of the Washington Mall space is impeded; only a partial views are visible, and distant views and visitors are cut off. This limits the feeling of the vastness of the grounds, forcing one to directly look at a highly polished wall and project within the space beyond the wall’s surface. The human sense of equilibrium is strongly related to their view in relation to the horizon. Conventionally, humans sense of normality is strongly linked to flat orthogonal planes. When the ground and wall plans shift in angle, even the slightest, against the horizon humans impulsively and continuously try to find their center of gravity. Slight angular deviation from the norm is used in Yad Vesham main museum and the Holocaust Museum. 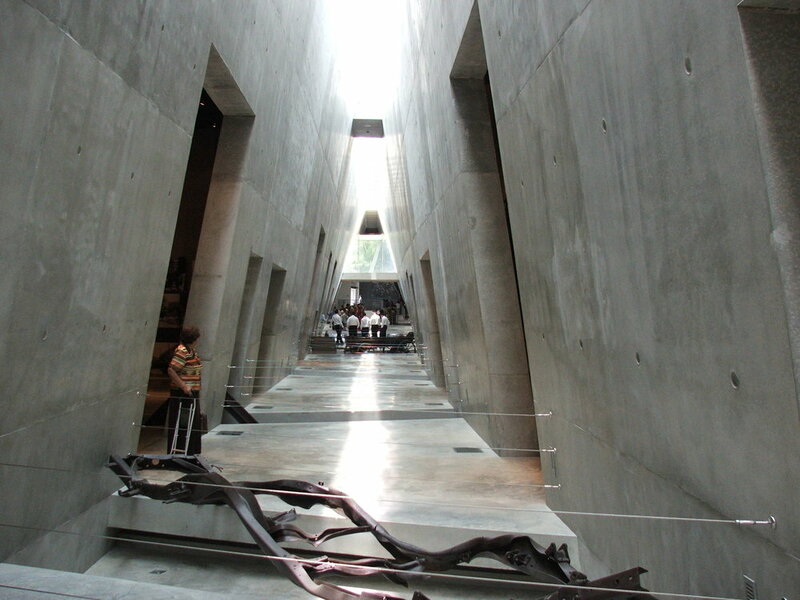 The different floor and roof planes, in the case of Yad Vesham, and concrete slabs of the Holocaust memorial change the viewers perspective emphasizing the feeling of insecurity and unsteadiness. In Yad Vesham, the main circulation artery is designed as prism, where the walls angles are constantly changing. This is along with the floor planes of the area, which ramp ramp 5 degrees downwards and then upwards, distorting the visitors perspective. Similarly, the concrete blocks in the Holocaust Memorial, which are all the same size of 238 cm, and spaced at equal intervals of 95 cm, are all at different in inclination. A further destabilization design element. In the case of the Vietnam Memorial the only planer inclination is a ramp leading into the Memorial landscape. The top of the wall aligns exactly with the mount of earth behind it, which results in an unexpected experience when beginning to descend the ramp and entering the space. Furthermore, the perception of the absent space is incomplete without the human interaction. Directly facing the wall, the spatial depth perspective is adjusted depending on the height of the viewer. In addition, the viewer can see the others first before finding their own reflection. Hence, understanding that not only does one see oneself and others, but sees oneself in the other’s eyes. Heightening the self consciousness of the memorial’s visitor. The idea of turning sharp corners and caught unaware by changes in view, are other destabilizing techniques that have been manifested in all three examples. On entering the main circulatory space in Yad Vesham, one has a clear view to the end of the space. However, the space is divided and roped, impeding direct accessibility forced by a zigzag motion. On entering the children’s museum, it is not a direct approach; the entrance appears as one comes around a bend, surprising the visitor. At the outside perimeter of the Holocaust Memorial in Berlin, the ground plan starts at grade level and concrete blocks are at a welcoming bench height. As the view welcomes one in to the hollow, the ground plane drops 2.4 meters below grade, and simultaneously the blocks grow to 5 meters. This change in scale happens quickly and unexpectedly. This sudden growth of view also occurs in the Vietnam Memorial. Often people come upon the wall unintentionally. This is because the wall’s top is level with grade behind it. The earth is scooped out in front of it to a depth of approximately 3 meters at the apex. What takes the visitor by surprise is the increasing number of names etched on the wall along the descent into the space. The children’s museum in the Yad Vesham landscape is an architectural complex consisting of dark rooms lined with mirrors. Five endlessly reflected candles that signify the ‘souls of the children’ create a paradox within the space where light and darkness are mixed. 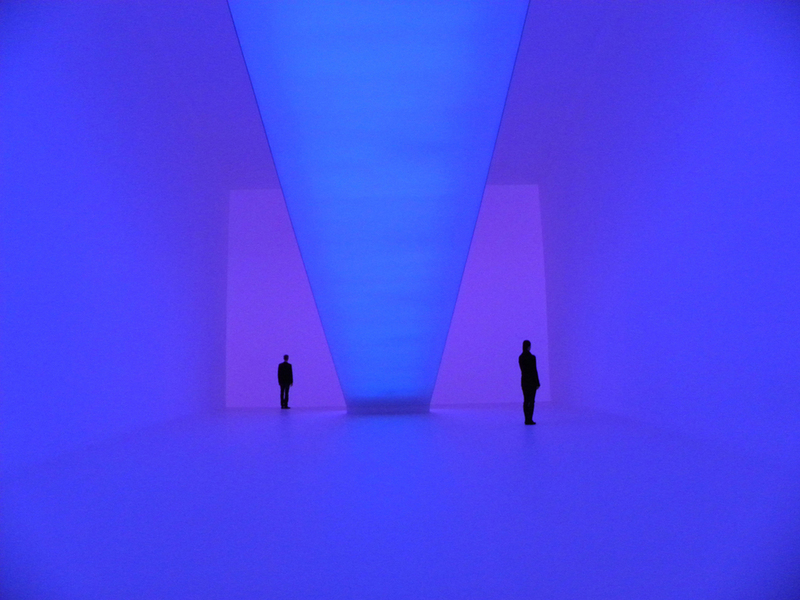 As the visitor moves into the space, so do the reflections of the candles enhancing the disorienting experience. The darkness of the room here is like the highly polished surface, of the Vietnam Memorial wall, which do not allow for passive clear reflections. In the case of the Children’s museum the visitor, moving closely to the reflective planes seeing a dark reflection of their selves among the million splintered reflections of the candles. In the Vietnam Memorial, the reflection of oneself is seen behind the names of the lost individuals, engraved on the wall. In both cases of reflectivity, in the children’s museum – Yad Vesham and the Vietnam Memorial, the smooth surface compels the viewer to reach and touch it. Touching the Vietnam Memorial wall verifies, solidifies, and grounds the engraved names from their apparent floating state. Another phenomena that occurs when touching the dark surfaces; a darker less lucid hand seems to be reaching forward from the space within; creating a connection to the separated and lost individuals. Another, tactile manipulation is clearly found in the Holocaust Memorial in Berlin is the undulating and buckling ground, that forces a jerky unsteady walk. The feeling of the topology under ones feet throws normality out of kilter, enhancing an unsteady sensation, and gnawing at the sense of familiarity. Individually each of the previous sense manipulations are strong on their own. However, they are amplified when coupled with the manipulation of the auditory organ. What is heard, or unheard, is what highlights the subliminal narrative intended behind each design. Aside from the obvious atonal music greeting the visitors to the children museum, at Yad Vesham, along with the recited names of the lost children there are other implications. The most obvious is found in the Memorial in Berlin and the children’s museum, both Eisenman and Safdi purposefully constrain the users visual ability, forcing the user to depend on their auditory sense to predict what is around the next corner. In the case of Eisenman’s design, when standing at the parameter of the site, the visual sense is saturated by finding a pattern, where everything, seems monotonous, allowing for the other senses to awaken. When the visitor is within the concrete ‘jungle’, the only means of apprehending what is around the corner is what one hears. Similarly, and less subtly, Safdi moves the visitor in darkness. Even though the darkness is mixed with candle light reflections, eluding that the visual sense is working. It is not enough to navigate. Tight spaces lined with smooth sound reflecting surfaces, such as the bunker like entrance at the children’s museum, and the smooth concrete faces of the Holocaust Memorial in Berlin, reflect the visitor’s own sounds back to their ears; such as footsteps, breath sounds, and voice. Thus bringing one closer to oneself, and enhancing one’s self consciousness. In the landscape of concrete blocks, of the Holocaust Memorial, act similarly to the Vietnam Memorial wall, detaching the viewer from the outside sounds of the city. Plunged in the center of the Holocaust Memorial, one can see the occasional bus drive by, but is unable to hear it. This is because not only are the concrete blocks acting as sound barriers, the sound waves that have not been blocked are traveling above ear level. This applies to the Holocaust Memorial, and partially to the Vietnam Memorial, where the only sounds that are heard are from the landscape behind the viewer facing the wall, and the other visitors to the Memorial. Coupled with seeing others reflections in the space beyond the wall, this phenomena enhances the meant narrative of connection.